The zipped folder contains 3 files. The first is the building guide with 52 pages of photos and text and the second has 14 drawings and a BOM - all of which print on regular 8-1/2" x 11" paper. There is also a file with 6 drawings that print on 11" x 17" paper. 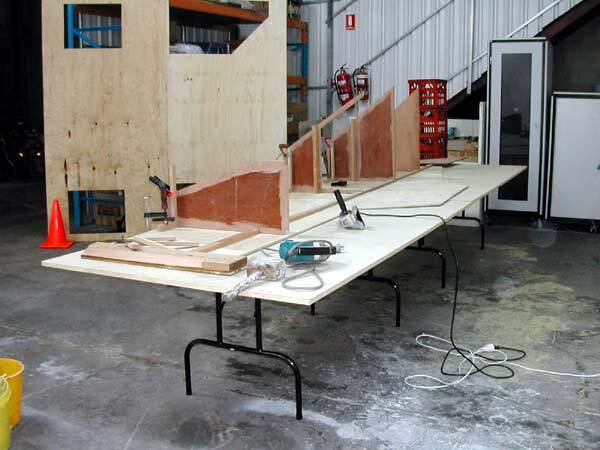 Hot Chili is a strong plywood asymmetric catamaran which can be built by anyone who can measure, cut and glue timber, can be towed by anything on four wheels, can be afforded by anyone with a job, and can be used anywhere with a foot of water. Chili can be sailed, powered, or both; and can be sculled over the stern. She can be camped on at anchor by 2 adults or a small family, or beached to set up a campsite. Minimal extra build effort renders her unsinkable, in standard form she will float swamped. Last but not least, Hot Chili is both striking and unique. The price will be 100 US dollars. Cost includes airmail. You will receive a wad of drawings with around 50 pages of text to help you understand and use them. Photographs from the prototype build have been posted HERE (follow links at top of page). I will put plan buyers in touch with all previous buyers who consent. When sufficient numbers have developed I propose a Chili builders web discussion group on Yahoo so myself & builders can help each other along without repetition. Is fast, the boat being semi-monocoque, with a chine log but no stringers. The protoype is one third complete after 60 hours. Time savings are inherent in the design’s conforming to the material – the flat hull and cabin outer sides are cut from two joined sheets of 9mm ply. The sides are linked by an 8ft square 2-sheet 12mm bridgedeck, to form a flattened “H”section, and thus define the entire outer shape. The bulkheads are placed inside this, trueing up the structure and preparing for planking the curved inner sides. The upper and outer edges of bulkheads are lofted in sheet corners, exploiting the accuracy of factory-cut right angles. After planking they form a tunnel, angling from 45degrees at the stern to vertical at the 6” x 1” laminated stem. The stem protrudes vertically to take the front cross-beam if it is required for nets and/or a spinnaker prodder. Once the narrowish dory bottoms are on, the boat receives a layer of glass below the waterline, the only glass used on the boat except for some taping around the stem and other areas of end-grain exposure. Essentially you have an 8ft square level viewing platform which floats in ankle deep water and is easily driven. From here the possibilities for personalising Hot Chili are so vast that I expect no two to be the same. However there are two major themes for Hot Chili…. The cheapest way to go about this is to build the bare 15’ 3” hull of Hot Chili (refered to as HC throughout these notes) and transfer the entire sailing rig and rudders from an old beach cat. In this way an older person like me can trade in his or her beach cat for a more stable and only slightly slower yacht on which one can go camping, and sail all year round, getting wet only when one wants to. Unless you are intending to use a prodder (bowsprit) to run assymetric spinnakers, you can build the simpler wooden front crossbeam, use a beam from your old cat, or have no front beam at all, though this sacrifices the chance of a net/tramp. The hardware should transfer directly though you may need to lengthen your tiller arms, and will need to calculate your daggerboard position to match the rig. If you email a dimensioned sail and mast profile to jgilbert@webone.com.au I will be happy to assist. If you want an auxiliary motor, use one you can carry easily, the smaller the better. If you are buying new try to afford a four-stroke, they are kinder on ears and fuel. The biggest I recommend is a 6HP, there are now several (Suzuki, Nissan, Merc) long-shaft 4-strokes weighing under 58lbs. A trolling motor would make a passable auxiliary for limited use, position the battery bank as final trim and you have power for a wonderful camping set-up. HC is an ideal platform to experiment with bigger electric motors, outboard or inboard, even in one hull. Imagine fishing a mountain lake of a still evening, not a breath of wind and your campsite a mile away. With an electric motor its an easy 12 minutes, barely disturbing the scene. The plans do not yet include a tabernacle as they need to be tailored to the particular mast and rig. I will add a generalised design for an unstayed mast of around 20 feet. Builders experienced and keen enough to experiment with their own rig designs will have a ball. 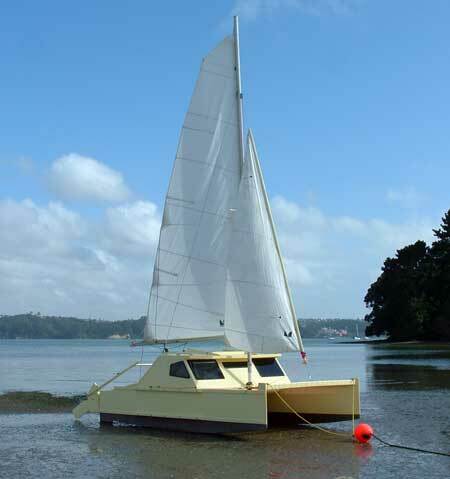 Single sheet “Easy Rigs” of the Rob Denney (see Duckworks design pages) persuasion are perfect for this boat with the cabin peak to deck height offering adequate bury. Tabernacles would also brace to the cabin roof peak, and offer an opportunity to use the mast as a tent ridge pole. I hope to find time to design HC a gaff rig for home building, object being to complement the boats angular lines, whilst maximising sail area on a low aspect rig. Some say this will be slow upwind, I say if you are late for dinner start the motor. With its an 18 inch underwing clearance higher than the few comparable cats, HC will be quite at home in ocean, lake or river. A 10HP motor provides close to 20 knots, so as a fishing boat shes economical and swift enough to run for cover, and beachable when she gets there. She can be winched up a beach, or lifted bodily by 4 adults. With her hull space available for stowage, I see her best use as a weekend camper for two. A standard tent can be adapted to fit her decks at anchor, she can be beached to set up a campsite, and in extreme weather one can retire to her dry bunks. She can carry 1200 lbs of people and gear without complaint and only a couple of inches lower in the water, but will performs better on her waterline, with a third of this load. A 25 HP outboard will overpower HC unless she is carefully trimmed for planing at over 25knots. I regard 15hp/20knots as a reasonable maximum, but would personally settle for one of the many quiet and efficient 4-stroke long-shaft 9.9HP outboards available. Hot Chili was drawn by hand in 1999, aiming to be the most attainable 2-person performance pocket yacht to date. By attainable I mean it can be swiftly built in a garage with the spare time and funds from an average wage-earners job. The term performance includes both on the water (easily driven and handled) and off (strength & longevity). Speed and ease of build have been considered in every aspect the design. Many will claim that HC is sturdier than strictly necessary & that it could be built lighter. They are quite correct, and there would be some gains in launchability & speed. There would also be big increases in both build time and ability to capsize. What is the point in perusing those last few ounces?? One can see at a glance this is not a racing boat, it’s a fun camp-cruiser with a turn of speed. I’m a big guy with big boots, & prefer boats strong. I’m not a brilliant sailor, but love coastlines and sometimes sail up rivers full of rocks, intermittently clouting them. Plus I don’t like skittering 50metres sideways while I’m fumbling with the daggerboard. You can tow the “heavy” HC with 4 cylinders and the lightest of trailers, so build the version that wont break if you make a mistake! The abundance of right angles produced by maximising use of factory cut ply sheets produced a tough-looking design, yet one which calculated at less than one horsepower (HP) for displacement hull–speed…Hot Chili could double as a sheltered-water motorboat, or trailerable motorsailer. In particular she looked useful as a river commuter, -at worst Hot Chili would plane at six times sqrt(HP), so wouldn’t require a big motor. In 2002 I transferred the design to computer to fine-tune and optimise the hulls for loadcarrying & performance. The hull bottoms were broadened & inner hull sides steepened from the original 45 degrees to facilitate building, optimise Bridgedeck (Bdk) clearance, & make HC both less tender and easier to lift onto a plane. This development almost eliminated the original torturing around the bow – the scarfed inner-side planking now just underwent a slight twist along an easy curve. Flexiply was originally specified, its not needed now. These developments don’t alter the extremely short build-time possible in HCs simplest iteration – nothing in the hulls, an 8 x 7 deck with a cuddy offering both dry stowage & a double berth open to the stars, or coverable with the huge hatch in case of rain or cold. No forebeam, simply an inverted “Y” forestay to both bows, and swept back sidestays to chainplates at the cabin sides just behind the windows. No spinnaker, simply the single-sail cat rig from such as a Paper Tiger, or the main and blade jib from something along the lines of a Hobie 14, giving 100 to 150 sq ft. I sat on the design over 3 years before finding a builder who would endure further simultaneous development during the build! Thus these plans have the considerable building and sailing experience of Jim Townsend seeded throughout. Thank you, Jim. Hot Chili offers beach catamaran sailors the chance to stay dry and sail all year round, albiet at a slightly reduced pace. Simply build your beach cat straight over onto a Hot Chili hull, using everything, rig, rudders and even the net out front and daggerboards if you wish. On a reasonable wage one can afford both the time and money to do this over a winter lay-up, losing no sailing time. If you don’t have a beach cat, buy one cheaply in winter, if possible from a place that’s cold in winter (sails less worn, boat cheaper). Its good to buy from racing types who usually have lots of sails, look after their gear, and are realistic about value. In Australia you wouldn’t pay more than a thousand (550 US) dollars. Huge possibilies open up for finding old garaged Pringles, Sol-Cats and the like. You could be lucky and find a cheap one, say with a damaged hull. Try your Yacht Club, Ebay, the newspaper. If you don’t mind building rudders, you might go for a dinghy, a Mirror or a Laser with its pop-in unstayed mast might suit. Beware of ultra-high aspect rigs that are difficult to step, although with a lighter person standing on the cabin you will be OK.
You can now have a dry boat you can camp overnight on, and can take mates sailing all year round without handing them a dose of hypothermia. You can also take Chili wherever you go behind any 4 cylinder vehicle. This depends on so many factors, not the least of which is your enthusiasm which comes in finite and difficult to guage quantities, and can run out before you cut a panel. For this reason you should save time by using basic power tools, router, saw, sander & drill. If you live in the Boondocks beg, borrow, steal, buy or rent a small Generator. If you are doing the most basic package referred to above, converting a beach cat, double the cost of your ply and add the cost of your beach cat. There are about 16 sheets depending on your lofting skills. A full material list is being prepared. The plans provide for so many options that no two HC’s need be alike. The most complex Hot Chili would take twice the build time of the simplest, yet may not be what you want. Look at the optional items one by one and your Hot Chili will take shape. Alloy Forebeam was conceived to carry the Prodder for a Screecher (Assymetric Spinaker/Reacher) This high performance sail was a requested addition. The standard design plan consists of building over a beach cat rig. If these have a jib at all, it is likely to have an inverted “Y” harness to fix the forestay to the bows (SS eyes thru stems), and carry about 50sq ft of blade jib. For “standard” sail plans from a suitable (similar length) beach cat, one only NEEDS a front cross beam to carry a net/trampoline. I’d use the 3 x 2” timber beam sketched at the top of Drawing 5 , and sheath it in 6mm ply to hold a small upward curve and help the bond to the stem stubs. I’d mount a tramp to cut spray. No front beam at all is quite OK, especially for calm water use where spray is not an issue. Many owners, especially of unrigged motoring Chilis, will never venture forrd of the cockpit. Hull Berths, two at 80 x 21”. Footwells, mostly used sitting on the rear beam which can be up to 14” wide over the hulls. My choice would be a wooden front beam, no prodder and an assymetric cockpit. This means a seat one side with the attendant larger hull berth having the larger permanent access opening which would be covered by the hatch when in motion. A single footwell in the diagonally opposite corner would complete the “high seat/low seat” cockpit. The secondary hull berth would have a flush-fitting hinged lid where the outboard could be locked to secure the yacht. 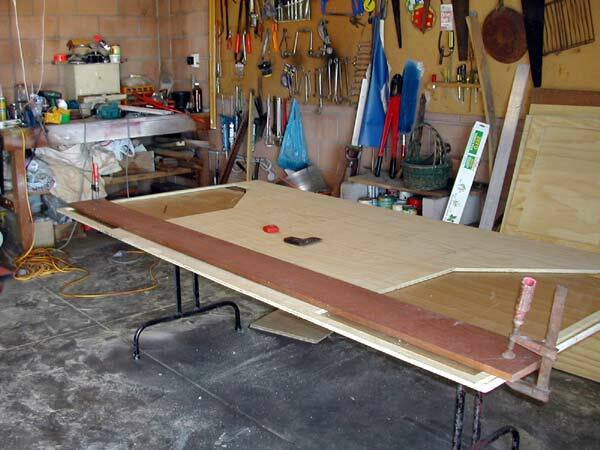 The boat is designed imperial for Australian and American ply in 8 by 4 ft sheets. I’m not going to convert plan dimensions to metric and here’s why. If I do, someone will go goody, rush out and buy 2400 x 1200 ply, and start building in metric with these undersized sheets. If one converts the dimensions directly by the usual 1foot equals 304.8mm then starts building with 2400 x 1200 its only a matter of time before you get into an insurmountable mess. At best the last things you create will be cumulatively undersize, at worst things wont fit at all. Solution If you can only get 2400 x 1200 ply, build in mm and scale down the whole boat as you convert the imperial dimensions. This is as easy as falling off a log. The design requires 8-foot sheets, you have 2400mm sheets. Convert the plans at 1 foot = 300mm and 1 inch = 25mm. Voila. (Your boat is 1.6 percent smaller than the design, bad luck, you live in a country that makes undersize ply!!!). Start stockpiling timber now! Grab odd bits of scrap ply and pine offcuts, there are skips fiull at building sites headed for the dump. Grab bits of oregon and hardwood,, you only need a 2ft 6 ins of 6 x 1 for your stem. Youll need an assortment of sizes for bracing, temporary struts, measuring (a stick and a pencil dont transpose figures) and padding clamps (collect clamps too). If you don’t have a ute, put it in your boot, tie it on the roofrack. Boatbuilders cars should be sacrificial items. The main structure of Hot Chili depends on the manufactured ply being true, try to buy it all together from the same firm or preferably run, so its all the same. If you want a boat with incipient cancer, buy the cheapest ply. Use the best you can find, at least BS1088 Boat Building Standard ply. This might seem expensive, if check out Duflex panels or foam core FG and see the price of getting covered in toxic crap. (They will tell you its easy, fast and fun, but you wont care what they say, because you will already be too frightened by the price). Go back and buy the marine ply. You still need a bucket of epoxy and 10sq m of 290g/sq m glass cloth, but only a tenth fraction of foam core or full FG layup. Even if its further and dearer, a lumberyard which knows boats will save many tears, and you’ll feel confident about your purchases. If you are in a multipurpose hyperbarn with a zillion grinning idiots with uniforms and nametags, buy some cheap sandpaper and leave. You are looking for a yard where they consider your project, have the time and knowledge to tell you what you are getting, and will help selecting your own straight grained lumber and knot free ply. This last is probably superfluous, marine standard ply has at least one good face, waterproof glue in the right amounts and no hollows. An exception to #1 above is the 1.5” bend towards the centreline of the cabin top, making the inside width of the roof 7.75feet to the bridgedecks eight. This is done to prevent leakage & possible delamination at the top of the cabin sides (the cabin roof can now cross this exposed end-grain) , to aesthetically relieve the constant right angles, to make it easier to work the daggerboards without grazing knuckles, and to provide more width for crew on the optional hinged fold-down side-decks. Side-decks may either complement or replace the hinged roof as a means of forrd access. They should hang from light (possibly plastic) chains & hooks (thus making their angle adjustable) and sit at a slight up angle of about 80deg to the cabin side, ie 100deg to the hull. At this angle they will make effective buffers. A long notch or slot in the side-deck edge where it hinges to the boat side replaces the upper positioning rung of the daggerboard , implying that the corresponding side-deck must be down for a board to be used. Side decks should be just wide enough for crew to “sit out’ and balance the boat on a fast reach. They can be used for a spot of mild hiking –you’ll need to build some timber hand-rails along the cabin-tops at a comfortable distance between the edge and hatch. Despite absorbing a foot of accommodation length, the integration of the Bdk with both crossbeams is literally a design strongpoint. 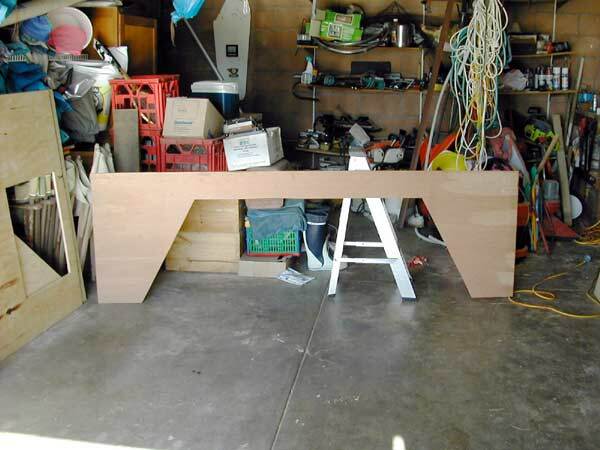 Additionally, there is far less work in setting up and building the beams, they are ideally spaced at half boat length, and there remains enough space (83.5” x 48”) for a couple to sleep longitudinally. Some crew find the motion of multihulls makes sleeping athwartships uncomfortable. The answer is to beach the boat, it’s designed for it. The last action before painting the upturned boat is to add some sacrificial 1 x ½” hardwood laths to the bottom and optional rear fin. These could be capped with metal channel or stripping, held on by a bedding material such as Sikaflex. Purbond waterproof glue is perectly adequate for build joins, and less messy than epoxy which can be reserved for filletting and filling. Save your fine sawdust, or wood flour as it is sometimes called by boatbuilders with aspirations to Chefdom. This is great for thickening epoxy for filling and filleting (more cooking imagery). Don’t epoxy anything except joins, and areas that are about to become inaccessable, until the boat is complete, or you’ll exhaust yourself and blunten your tools working with material which you’ve just converted to virtual steel. An argument rageth on the web, time penalties for this approach are being debated at 7 times. Without FibreGlass Hot Chili wont necessarily leak. To be certain fiberglass the bottom below the waterline, and better still from outside WL to outside WL right across the bottom of the bridgedeck, which is only 10 square meters maximum. One layer of 290grams/sq m. will do, we want a water barrier not structural strength of which we have plenty. Any start-points for delamination should be covered with FG tape other key areas such as the stem, around transoms and anywhere that a ply edge is exposed –these are lethal. Several coats of epoxy on such edges is likely to prevent delamination, glass taping will. HC accomodations were designed at Bridgedeck level for simplicity and flexibility. There is plenty of hull stowage, and the 41½” x 23” flat hatch cover stows upside down under one side deck. This has no impact at all on the resultant enlarged day-sailing deck which also provides access to the mast. Moving forrd is rarely necessary, but good for cooling off on the net/tramp. It’s simply a matter of stepping over the windscreen, or sitting on the roof peak and swinging your legs over. Though it makes the build more complex, those who wish may incorporate hull berths between BH1 and BH4. These have myriad advantages, not the least of which is one can get up in the night without disturbing the other. Hull shape & size dictates feet-forrd, & theres not much room under the crossbeam. Entry is tight, but easy with the hatch off, simply swinging under from a grip on the hatch coaming. Once installed, you will be really comfy, and well supported in a seaway. All but the biggest sailors can fit the berth low enough in the hull to provide sitting headroom, even with HC’s low cuddy. Hull berths would be a real boon to serious coastal cruisers, who wished to eat up some overnight miles with helm watches interspersed by ballast duty in the windward berth! The shakedown cruise for Hot Chili is to be a 400 mile reach on the Australian coast, returning by road. Hot Chili will lap it up! The large stowable roof hatch essentially removes all but the windscreen and strength-providing roof peak across the boat. This setup lends itself to mosquito netting & a various standard tents. 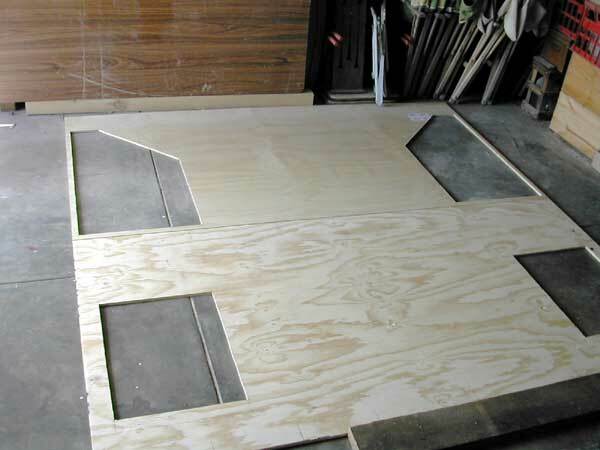 A standard 8’x 6’ A-frame would fit around the coaming/cabin edges. A poleless igloo 8 x 8 would go over cabin and all, secured around the sidedecks and XBeams. If the boom were lashed out of the way or hoisted, one could attach the peak of such a tent to the halyard. With a calm sea and 10 HP, Hot Chili will happily bowl along on half throttle at 12 knots, and hit at least 17 flat out. Builders with motoring in mind may wish to raise the cuddy design against spray, and either eliminate the rig, or rationalise it by removing the prodder and installing a mast tabernacle. To optimise this dual role, the designer is researching a source of telescoping 20ft alloy masts. Hot Chili is a real solution for those who think they are doomed to save forever for “a decent boat.” You can savour the feeling of sailing a boat you built yourself, and you wont be exhausted or broke by launch day. You will sail past boats costing 50 times as much, and can take your boat on holiday without making the drive a nightmare. You can spend 200 hours building and 2000 sailing, instead of vice versa. Your boat will be the focal point at Messabouts and Wooden Boat Festivals. Hot Chili is enviromnmentally sound. Hot Chili is heaps of fun. Can you think of a better way to go?